Bookreaders ftw! Not that I would give up on harbacks and leatherbounds anytime soon though. Oh no! I hope you’re feeling better! Also, I love the hanging dragon. That’s awesome. I am, thank you very much! Love poems! Are you reading just to be reading, or do you have a target in mind…? 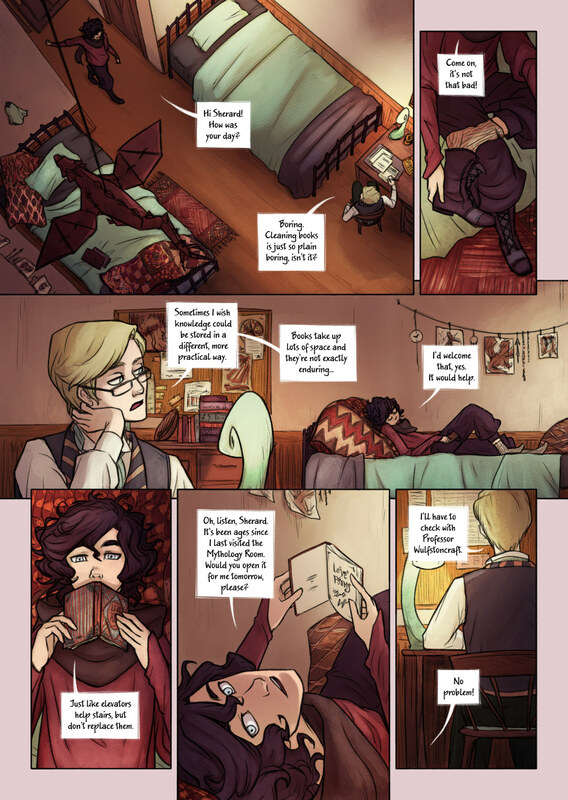 A slightly longer third-to-last panel would make a wondrous bookmark, wouldn’t it? I agree with Rogier. I like reading, period. Most books aren’t good quality books with sewn pages and pages that lie flat with the book staying open. With the injuries to one wrist and painful fingers, it’s tiring to hold the pages open and my hands soon ache. It’s why I do almost all my reading on a tablet now. That is so true. I sometimes get really tired wrists and can’t hold the bigger volumes, or carry them while travelling. E-books help there so much!